2) The video being released as it was, seems to be much akin to the Islamic State claiming responsibility for bombings it had little to do with. Except that they can certainly lay claim to have riled up the crowd. Not once do you mention the Hebrew Israelites. Doesn't their behavior, and role in the release of the video seem rather central to what went down? I can't see leaving them out of the equation. I'll leave a picture of Sandmann, lest you retain the meathead picture in your mind. Hi Ted - while I was writing my mind was focused on the group, though, as Sandmann had become the "face" of the story, I (unintentionally) put him front and center. While I saw him as the "Biff Tanner" leader with his "posse", that might not be fair. I really dont know what kind of person he is "in real life." 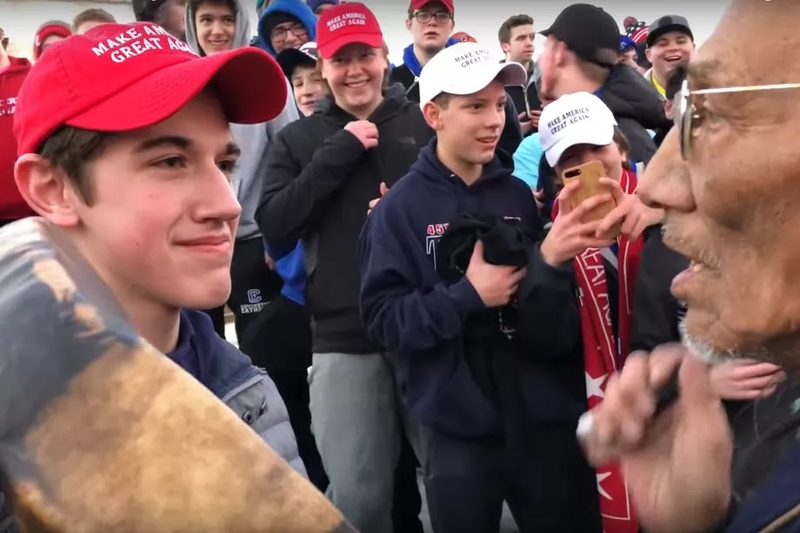 In fairness, perhaps I should re-write this removing Sandmann from the center of the story. But your comment about symbols is so perceptive -- and as for packs, I highly recommend Frans de Waal's book "Chimpanzee Politics." Adolescents jockey for power--an opportunity for a young aggressive male to step up and display bravado in front of his peers may be too compelling not to take. In our conversation, I was simply pointing out that the body language and other visual cues were characteristic of a dynamic that is ubiquitous and easy to spot. What it all signifies for our national politics has everything to do with what we the viewers bring to the table as we respond to the freighted symbols tof the hat, the native dress, etc. Lots to think about here. Thanks, Andrew!